It is quite difficult to decide which is best: a rooftop tent or a ground tent. The truth is that both have advantages and disadvantages and there are a few factors that will determine which one will work best for YOU. Rooftop tents are quick and easy to open but the stepladder can be uneasy. A rooftop tent is the easiest way to sleep off the ground. This is helpful when your campsite is uneven, overgrown or water-logged or the soil too soft to anchor a tent. In these circumstances a ground tent would be less than ideal. In wilderness areas people tend to prefer rooftop tents for putting some distance between themselves and wild animals lurking around at night. However, this is a false sense of security and you will be just as safe in a ground tent that is properly zipped up. Being fitted to the vehicle, rooftop tents can withstand wind speeds for which ground tents might need to be anchored. Rooftop tents are quick and easy to open. However, you need to close your rooftop tent every time you want to use your vehicle. Ground tents can be left behind in your campsite. Big ground tents may be comfortable to live in but they are bulky to store in your vehicle and can be time consuming to put up. Non-pop-up tents do for sure take much longer to erect than rooftop tents and are not ideal if you tour and move camp regularly. Ground tents come in a greater variety of sizes for larger groups while most rooftop tents cater for only two people. 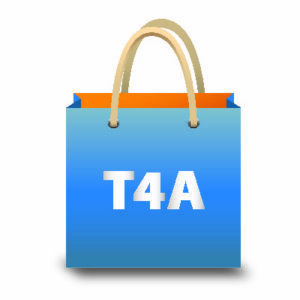 Very few cater for up to four, and those tend to become heavy and bulky. There can be a significant cost difference between entry-level ground tents and rooftop tents – a budget two person dome tent is far cheaper than the cheapest rooftop tent. If your vehicle doesn’t yet have a roof-rack or luggage bars, it will add to the cost of fitting a rooftop tent. Together with a roof-rack, a rooftop tent can increase your vehicle’s fuel consumption by as much as 10%. However, much the same applies to a bulky ground tent transported on the roof-rack. Ground tents are inexpensive compared to rooftop tents. Lastly there is one very important factor which might rule out a rooftop tent for you: your mobility. It is possible to stand up comfortably in the bigger ground tents whereas you can’t in a rooftop tent. If you invest into a proper sized ground tent you can sleep comfortably on a stretcher and don’t need to crawl in and out of your ‘bedroom’. Getting up and down the stepladder of a rooftop tent can be uneasy, especially if nature calls at night. Bear in mind that a rooftop tent is not as safe as a ground tent. Tripping and falling when you walk out of your ground tent is one thing but falling off a 2m high ladder when getting out of your rooftop tent is something totally different. You can injure yourself quite badly and spoil your long-awaited trip. Think carefully about your needs, abilities and the places that you want to travel and consider all the pro’s and con’s of ground tents and rooftop tents before you invest in a tent. I think Ground tents is the best one and more efficient. we are planning a trip across the CKGR and are a group of 3 guys. one joined the group later and isn´t allowed to sleep on the ground by his wife but consists of not having two roof tents mounted on the LandCruiser, since we need the space for firewood and extras Diesel. Should we leave Moritz behind ? Not at all. Sleeping in RTT vs ground tent does not change the safety issue when camping in the wild. The elevated position is a false sense of security. Maybe you are out of reach of hyena, but cats can climb and jump. The rule is to sleep in a tent that is closed completely and when you leave the tent at night or move around after dark, be on the lookout for wild animals in or near your camp. Don’t drink too much either, the resulting bravery makes you vulnerable and you would need to get up in the middle of the night to go out for a pee:-) Oh, and don’t tell Moritz’ wife! I agree Johann. Ground tents are safe. They just don’t FEEL the same as a roof top tent. 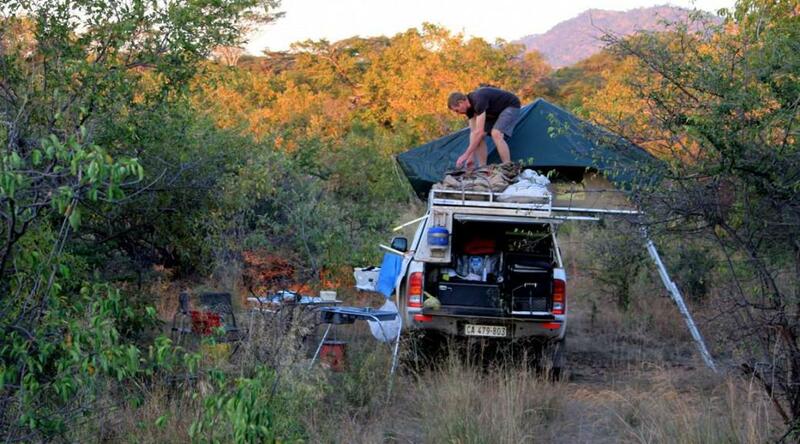 Last December I camped at Lesholoago Pan nr 2 in Mabuasehube. 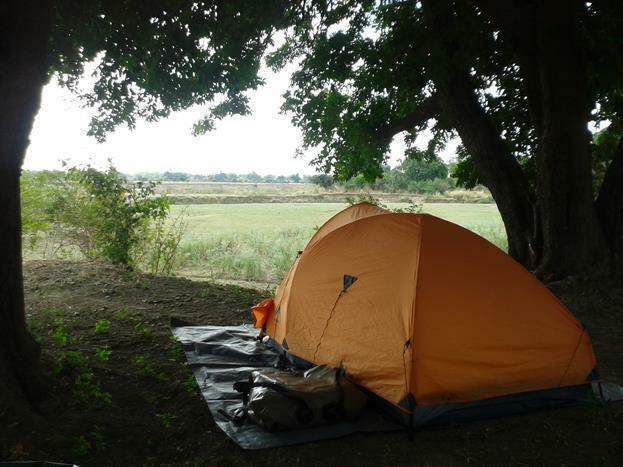 In the morning at 4:30 I woke up with a shock: a male lion was lying against my tent and started roaring. It was as if he was within my tent. The tree I put my tent under for shade appeared to be his scratching pole. I tell you honestly I was tense.All went well. Wow! What an experience that must have been. I would not have been able to sleep after that. But the only thing you can do is to be still. I fully agree. We use a dome tent and Jeep Grand Cherokee stretchers etc. and are ready to roll 15-20 minutes after getting out of bed. Ek stem saam Henk. My tent slaan so maklik op en weer af . Ek kan regop staan en uit en aantrek en ons slaap gerieflik op ons kamp bedjies. Wow Henk, you are setting an excellent example for the younger generation! I do sure hope to still be travelling like you at your age. I had a brown hyena sniffing at my head all night in Central Kalahari…. last time I left in ground tent. Hardshell rooftop also a lot warmer than ground tent. For the hyena: always have pepperspray in your tent. You’ll never need it, but it reassures you. Referring to temperature: hardshell will be warmer indeed, but the ‘regular’ rooftop tents are a lot colder in the Kalahari nightwind, I can assure you. That is quite interesting. I didn’t realise that a hardshell rooftop tent is hotter than a ‘regular’ rooftop tent. But it seems reasonable to expect that a hard shell keeps out the wind much better. It can become quite scary in a ground tent when you have lions and hyena sniffling around! It still amazes me that you are safe in your tent as long as you keep it firmly zipped up. It is as if though the animals don’t realise how thin the tent is. But that’s the thrill of a night you will never forget! And I have never heard of any problem. Except that German lady who slept with her feet outside the tent. Of course a lion is curious. BTW, in your original blog you mentioned that sleeping in a roof top is not safer than on the gound. Jy sê julle is 60+. Pla die op- en afklim teen die leer van die daktent julle glad nie? Ek stem heelhartig saam; kamp is bobaas! My partner and I have just done a year zig zagging through Africa and we had and used both and don’t regret the decision. Lucky you! I can believe it is best to have both options available. A two-man tent doesn’t take up that much space, so I’d say if you can, throw it in. Frank.. you mention vehicle height.. there is a SAFETY issue as well. Tripping over when walking out of a ground tent is one thing.. but free falling 2 meters from a rooftop tent is something completely different. Bottom line.. a rooftop tent is NOT safe.. Read the disclaimers from rooftop manufacturers. Typically you mention it….! My wife fell off the ladder at the Brandberg campsite. Seriously bruised back and unconscious for a short while. 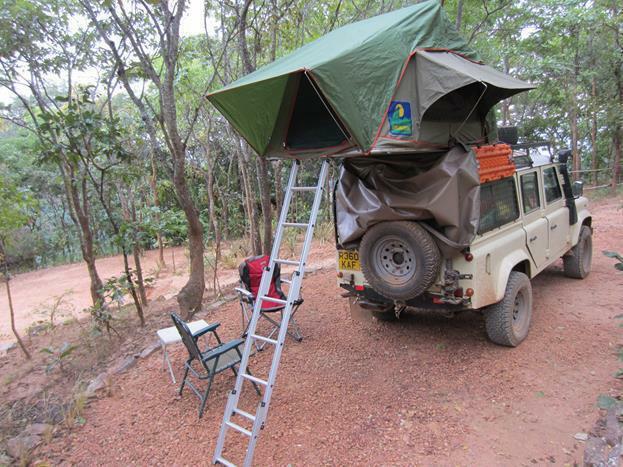 Because of the height of a Troopie, the ladder of the rooftop tent stood too vertical. Fortunately she recovered well; no lasting injuries. But every bump during the trip trough Namibia was painful. We travel a lot and found there needs to made a clear difference in the type of rooftop tents you use. The hard shell rooftop tent is definitely the easiest to use. You can set it up in less than a minute and close it up in less than 3 minutes – we use the Impi of Hannibal. Biggest drawback is no space on the roof for something else. The fold able rooftop tent we tried before but except of roof rack space gained it is not as easy to open and set up and closing it down makes you feel like a monkey on your own vehicle to fold everything and close up to go. If roof space is important to you rather go for a ground tent. Buy a proper canvas one that will last you for years. Yes, that’s more or less how I feel it.. I know that some rooftop tents can be a bit of pain to close. Like you say, you kind of feel like a monkey on your own vehicle. And on top of that it can be very dusty which makes you want to go for a shower after you closed your tent! We have both ground and rooftop and I just find it so much easier with the rooftop tent. (Hannibal Impy) Worth closing it when we travel for the day. I agree it is not that easy to get up if nature calls but with a Eezi-wee connected to a pipe running into a container under the car all is solved. We have reached a point where we cannot bother schlepping with a ground tent, mattress, pump, bedding, stretcher and making bed etc. We have a popup bundu shower for a dressing room if needed. Rooftop for us. Sounds like the Eezi-wee is the ideal solution for the nightly routines. That saves you from getting up and down the ladder during the night. For men: an empty bottle of ‘wasverzachter’ does wonders. For ladies: search a plastic container with a watertight screwable lid. In my opinion an important point is also that a roof top tent lifts the centre of gravity of the vehicle. You want to keep it as low as possible. I hàd a rooftop tent but departed from it. I drive a troopie. For some mysterious reason Toyota egineers choose to design the ground floor (so the overall height as well) higher than in a regular cruiser. It heightens the centre of gravity as well, but with respect to roof top tents: it is a hassle to erect and fold it on a high vehicle. You cannot simple fold it and pull the cover over it because you cannot properly reach what is needed. All has to be done while climbing on top of the car and standing or sitting on the folded roof top tent. Some parts can be done balancing on the back wheel. Then you have only ane hand at your disposal. I found it unpractical. So if you consider a roof top tent, keep the height of your car in mind. And imagine all the dust when you fold down the rooftop tent! Being short myself I know exactly what you are talking about battling to close the rooftop tent because you simply cannot reach. Elder people don’t climb up ladders. My ground tent weighs about 21 Kilos and it took me and my wife 3 minutes to erect and were sleeping comfortably on stretchers!!!!! Bekker Snr. Don’t you find it difficult to store such a big and heavy tent on a trip? You are right. Fortunately not all campsites have vigilant baboons and/or monkeys around.